For the New Year’s Day wedding of Irma and Javier Ayala, they had a unique groom’s cake to reflect Javier’s interest in filmmaking. 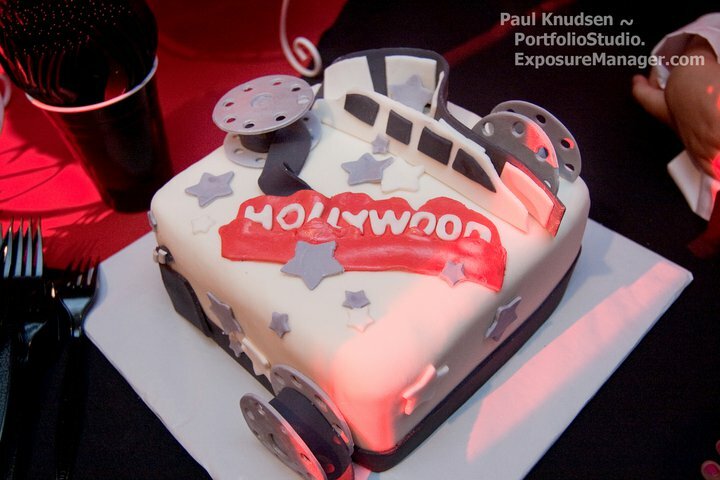 Hollywood Javier's cake, prior to "editing"
Photo courtesy of my old friend, master photographer Paul Knudsen. In honor of their marriage, the hometown college team won the Rose Bowl, and there was much rejoicing. They had a wonderful fun celebration with friends and family that lasted every bit of six hours, with a Party Machine photo montage and ceremony highlight reel that got “two thumbs up” from Javier. This entry was posted on January 2, 2011 at 10:36 pm and is filed under Let them eat cake!, Weddings!. You can follow any responses to this entry through the RSS 2.0 feed. You can leave a response, or trackback from your own site.